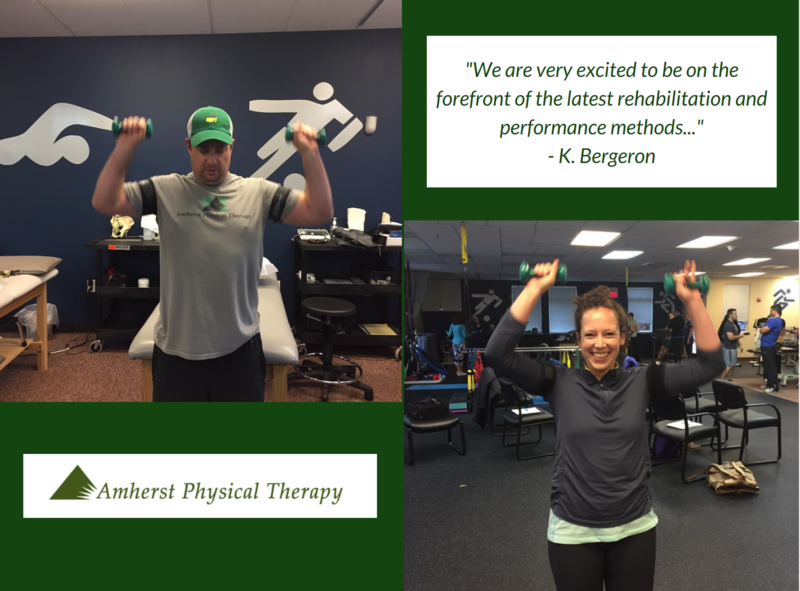 Amherst Physical Therapy is proud to announce that Kurt Bergeron, MSPT and Alyssa Stuart, DPT have recently received certifications in Blood Flow Restriction Training “BFR”. The certification is referred to as Cert. MST. Blood flow restriction training is a method of strength training that involves restricting the blood flow out working muscles to trick the body into getting stronger by creating a metabolic stress response. Muscle hypertrophy, or muscle growth, requires either mechanical stress (lifting heavy loads) or metabolic stress ( hormones and metabolites). In the rehabilitation, setting achieving muscle loading at a threshold high enough to induce muscle hypertrophy is very difficult. BFR allows us to safely train muscles at very load loads, limit muscle and joint strain, while achieving the same results as heavy loading. We can now maximize strength gains safer and faster without the side effects of traditional load based training like delayed onset muscle soreness, joint stress, and micro tearing! Blood flow restriction training is surprisingly comfortable. The pressure cuff induces muscle fatigue relatively quickly and with very little strain. A trained physical therapist, with the aid of a Doppler ultrasound, will determine individual blood pressure values and customize a protocol. The use of a Doppler and individualization of restriction pressure is vital to the safety and effectiveness of this technique. After the appropriate pressure is validated, a special restriction cuff is placed on 1-4 limbs during the duration of a prescribed exercise program. The exercise program can be aerobic, resistive or a combination of the two. The exciting thing about BRF training is that the effects are systemic. Using this method has total body benefit due to its action on hormones and growth factors that act on multiple systems. “We are very excited to be on the forefront of the latest rehabilitation and performance methods. As research uncovers safer, faster, and more effective techniques, we strive to be the first to offer these to our patients and clients. Additionally, we take great pride in the fact that our therapists are some of the best educated in the field. We strongly encourage our therapist to be over educated!” says Managing Partner Kurt Bergeron.